Every year brings a mix of high and low points. Hopefully, you have experienced positive outcomes in both your personal and professional lives. I’m delighted to say that that has been true for me in several ways. On the personal front, my husband John was declared free of cancer. This September was especially memorable. I was able to visit friends as well as readers of the Natalie Seachrist Hawaiian Mysteries in a visit to the city of my youth, Portland, Oregon—after an absence of more than twenty years. When I used to travel from Honolulu to Portland, I often planned a gathering of friends, which allowed us to catch up on one another’s lives. This was not possible on my last trip. However, each day I was able to see people who mean a great deal to me. The first evening, I saw had supper with Jerry Lesch, one of my favorite directors at the Portland Civic Theatre. We briefly met with my editor, Viki Gillespie, who was delivering marketing materials that I had shipped in advance. Although he was not aware of it, he had met Viki many years earlier during my performance in the play A Shot in the Dark, which Jerry directed. Later, her daughter had taken drama classes with him in high school. The following morning, Viki took me on a tour of the city. I found that the trees had grown phenomenally and the city seemed much hillier than when I lived there. Later, I enjoyed dinner with my former Highland Dancing teacher, Bonnie McKenzie and her husband Colin, a renowned bagpiper and composer of classical piebroct music. My next event was passing out Hawaiian candy at my 50th high school class reunion. The following week, I gave public addresses at my high school and a combined meeting of book clubs of the American Association of University Women. What a wonderful visit to the past, while gliding more firmly into my public life as an author! Successful cover art is the product of teamwork. In November 2018, Murder on Mokulua Drive [the second Natalie Seachrist Hawaiian mystery] won several awards. Notably, it won Second Place for Published Fiction in the 2018 Arizona Literary Excellence Contest. This was due in large part to the superb editing of Viki Gillespie, who has helped to refine each of the books in the series. Like Prospect for Murder, MOMD also won First Place for Cover Art Design in the New Mexico-Arizona Book Awards, where it was also a Finalist in the Cozy Mystery Category. Let’s examine how the winning cover art for this series has been achieved. Regardless of what you do in life, one of the major keys to your success is teamwork. Even when you are the primary producer of a product, you will be relying on the merchandise, talents, and skills of others. If you are an artist, you utilize a variety of products to create your art, and usually employ a framer to present your finished work to the world. Authors, whether self-published or working with a publisher, are likewise dependent on the output of others to finalize their creations. First, capturing their thoughts depends on a variety of manual and electronic tools. Succinct editing services are also required. Then there is the issue of layout, fortunately provided to me (along with overall publishing skills) by Geoff Habiger of Artemesia Publishing. Of course, he cannot complete his work without the final art designs brought to fruition by fine and graphic artist Yasamine June. While I possess some skill as a design consultant and can produce certain graphic art elements for marketing materials and my websites, I lack the tactile skills to produce truly refined artistic images. So where do I begin art projects? First there is the overall concept, generally driven by text I have already composed. For a book cover, the first consideration is determining the images that will evoke the essence of the story I need to highlight. Fortunately, when I began writing the series, I composed timelines, chapter synopses, and descriptions of settings and characters. Even a cursory review of these elements reveals a list of those that may be appropriate to a book cover and supportive marketing materials. 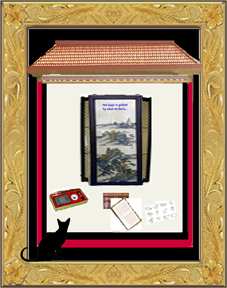 While some authors create new art for each of their works, I chose to present certain images with consistency including Miss Una, Natalie’s silent but fleet-footed feline companion and images like palm trees and ocean waters reflecting Hawai`i. In addition, I have conceived a recurring gold frame based on Hawaiian heirloom jewelry. I also utilize pagination folio art that I designed, and a gold hibiscus flower that Yasamine has refined. At the point that I have a list of elements that might be good for book jacket art, I begin roughing out a tentative layout in a graphic art software program. As I examine my list of suitable artistic elements, I manually draw a few pictures that fit the requisite portrait layout of a book cover—knowing that the final product can easily be converted to a square layout for an audio book. 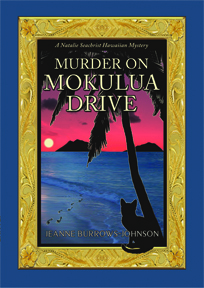 So where did the award-winning cover of Murder on Mokulua Drive begin? First of all, Natalie’s life has shifted from a high rise in Waikīkī to a cottage in the beach community of Lanikai on the windward side of the island of O`ahu. Next was consideration of the fact that the murder in this story occurs at night. What does this add up to? 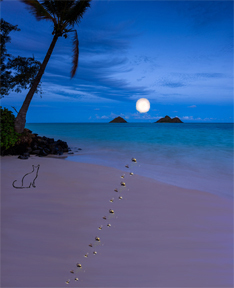 A nighttime beach scene which includes the Mokulua islets, the moon, a palm tree, footprints in the sand, and Miss Una. Additionally, although I will not be completing the design, I try to allow space for the insertion of Titling in my signature Peignot font so that there will be no overlapping of images and text. Here is the initial layout I sent to Yasamine. How did Yasamine’s magic polish this concept? Since this is the second book in the NS mysteries, I had been through the publishing process for the series once. 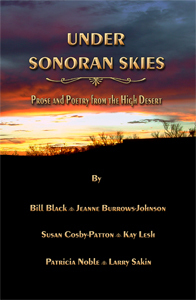 Additionally, I was able to draw on my experience as art director for the well-received multi-author anthology, Under Sonoran Skies, Prose and Poetry of the High Desert. For that project, I featured a picture I shot of the desert at sunset from my back lānai. Whatever your artistic needs may be, I urge you to be involved in the process, even if you are unable to finalize the images yourself. The input you provide to a professional artist will ensure a product that reflects your own work and the goals you may be setting for future projects…Here’s a look at the before and after images for the forthcoming Murders of Conveyance, being released in early 2019! I’m pleased to announce that on September 7, 2018, my third blog on the benefits of PUBLIC SPEAKING will be featured on the website of Hometown Reads, while I’m visiting my own hometown of Portland, Oregon. Once I’m home, the original, longer version of the piece will appear right here! While I’m in Portland, I’ll be addressing a combined meeting of mystery book clubs, plus students at Woodrow Wilson High School, from which I graduated 50 years ago! I can’t believe five decades have passed since I was fortunate to attend the accelerated classes in English and Social Studies that inspired later studies as well as my writing. I’m honored to announce thatMurder on Mokulua Drive [the second book in the Natalie Seachrist Hawaiian mystery series] has been nominated as one of six finalists in the fiction category of the 2018 Arizona Literary Excellence Awards! All the World’s a Stage…and it awaits the imprint of your brand! The success of any branding program rests on harmonizing the look, sound, and feel of all of its elements! That includes the setting in which an author appears. And while you may not be able to control every aspect of the physical environment of your presentations, you can enhance the positive impact of some aspects to boost the effectiveness of your overall book marketing program. If you have never spoken at the venue, you’ll be relying on the event’s organizers to provide the correct information regarding lighting, voice amplification, and projection of materials you’ll utilize to highlight your speaking points. In addition, they’ll be scheduling the podium, table, and/or chair from which you’ll speak. If possible, visit the venue in advance of the event. While this may be easy in your home town, it can be impossible when you’re working in another city [let alone country]. Therefore, it’s good to arrive a day in advance of your presentation. If you’re lucky, you will be delivering your remarks at the hotel in which you are staying. As this is seldom the case, travel with the basics you require to be effective. Depending on your height and weight, and position in relation to the audience, you may need to modify your hair, clothing, shoes, and/or accessories to maximize your facial and overall visibility. Speaking engagements often occur in rooms with a stage that is at least a step above the floor on which the audience is seated. This enhances your visibility as a speaker, but it means you must look good from the top of your head to the bottoms of your shoes. And although many stages are carpeted, older wooden or tiled stages may have uneven surfaces, for which you will require sturdy and slip-resistant footwear. Sole presenters in a public venue usually have access to a podium. Free-standing or table top, it should offer sides that mask your script, notes, watch, and other items you may need to reference. Unless a free-standing podium is constructed of a tubular frame, it is probable that you’ll be visible only from your chest up. That gives you more flexibility in your stance and movement of your feet. If the podium is comprised of a hollow frame, or positioned on top of a table that has no tablecloth, you will not have that luxury. The quality of your natural speaking voice can be either an asset or detriment in public speaking. Depending on your audience, even the strongest of voices expressed in the wrong tonal range can be hard for some listeners to hear properly. Many podiums are set up with a microphone fixed in position. If you learn you’ll be using a hand-held mic, you may want to obtain a small stand in order to free your hands for gesturing, pointing to overhead projections, etc. Having said this, I must note some presenters like to speak off the cuff rather from written material and prefer a hand-held or wireless mic so they can roam freely—sometimes even moving within their audience. Be aware that the effectiveness of the microphone you use [especially lavaliere or headsets] can depend on your neckline, arrangement of hair, and any chain or necklace you wear. Also consider that dangling earrings and loose watches or bracelets can interfere with sound projection. Having a strong voice may lessen the need to provide your own electronic equipment. However, if you are embarking on a lengthy tour, you might consider acquiring sound equipment that can make you more independent of the facilities in which you appear—if it is compatible with the speakers to which your equipment will be connected. In making such a decision, you will want to seek the input of an electronics specialist. Enlargements of colorful book covers, pictures of previous appearances, and banners with both your image and the works you’re presenting make a wonderful background for highlighting sales sheets, future project descriptions, and business cards. Since Murder on Mokulua Drive has an embossed jacket front, I present it on a stand, as well as on the table top to invite people to pick it up. If there is a theme to your work, you can add decorative items that reinforce that reference. As most of my work centers on Hawai`i, I display a shell lei or two, a golden fish business card holder, and tablecloths that harmonize with my book cover colors. If you’re speaking in your home town and have checked out the venue, you’ll know what you need to carry with you. The one thing that may affect your preparations is a change in the size of your audience, thereby impacting the number of books and handouts required. When traveling to a long-distance destination, you may be able to send a box ahead to a friend, colleague, or the hotel in which you will be staying. Regardless of whether that is an option, strategize the items that you should carry personally, rather than check into a luggage compartment. I recall my gratitude for arriving in Hilo (after flying back from the U.S. mainland) two days in advance of a performance of Scottish Highland Dancing, since my costumes remained in Honolulu by mistake. I now keep the following items with me personally when traveling to author appearances: memory sticks and a master copy of materials needed for display and distribution; one copy of pertinent books and project samples; one small tablecloth and a shell lei to personalize a display; one copy of a short biography; two 3 x 5 inch cards with an introduction of me and my presentation; a brass name badge and any pertinent professional badges; a beautiful artificial orchid for my hair; and, one elegant jacket to dress up even an emergency wardrobe purchase if my luggage does not arrive with me! 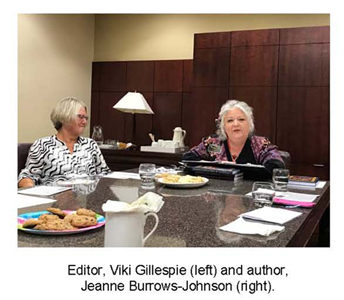 This is the second of three discussions of Public Speaking Engagements.My next blog will address the ways in which public speaking engagements can enhance your branding as an author, and will be featured at Hometown Reads . Today, I am using the phrase “Public speaking” to cover several means of communicating orally. First there are traditional public addresses, usually delivered from a podium. The Internet, radio, television, video, and other methods for presenting your image and words can also be included within this classification. Within a broader context, I believe it’s also appropriate to consider audio books and interviews. PUT SOME ZING IN YOUR PROMOTION! In my blog on Author Appearances , I summarized some of the necessary preparation for successful public readings of an author’s work. My comments encompassed a few basics for evaluating, seeking, scheduling, and marketing potential engagements. I also skimmed over aspects for preparing yourself visually and vocally. Today’s blog offers suggestions for preparing materials you’ll need prior to and during speaking engagements as an author. Some of these items may be useful in garnering opportunities for public addresses; others for shaping a rapidly-arranged display; and, some for quick reference during Question and Answer moments. All of them will be subject to constant redesign, as pertinent text and images evolve over your writing career. There are several support items you should have available for general marketing, as well as for your public appearances and speaking engagements. Some of these may be appropriate to share with the event organizers in advance of your talk. Depending on the venue, you may be able to set up a display, which I will discuss in Part III of this series, Public Speaking to Enhance Branding, to be featured on Hometown Reads in September, 2018. ~ Business Cards. Consider double-sided, or even folded cards, to promote multiple facets of your work. As the author of the Natalie Seachrist Hawaiian mysteries, I now utilize a folding card that allows me to mention my authorship and marketing consultancy on the outer sides, and two published books on the inside. ~ Résumés. Having résumés of varying lengths and types (sometimes on letterhead stationery) is useful. As I periodically provide marketing advice to executives and their organizations, I have résumés that address that aspect of my work, as well as another offering information on my authorship. Go to imaginingswordpower.com/resume—career-tips.html to view résumé and career tips. ~ Handouts. Depending on your audience, these may range from key talking points to reference data. ~ Fliers and Sales Sheets. These should feature specific books and other products you wish to promote. At this time, I am utilizing a double-sided flier. It features Prospect for Murder and Murder on Mokulua Drive. I also have one describing Conversations with Auntie Carol, an oral history project planned for publication as both an audio and print book. ~ Media Releases. I use a format highlighting the Ws of journalism–Who, What, When, and Where. View samples for both print and broadcast media outlets at imaginingswordpower.com/media-release-samples.html. ~ Photographs. Large and small, some should show you holding one of your books. ~ Posters and Banners. These can range from you and your current work to previous events. With regard to your actual presentation, let’s consider the text of your talk. Do you require a formally written speech in order to provide an effective performance? Before you answer, consider the environment in which you’ll be speaking and your audience, as well as your strengths and weaknesses as a speaker. Personally, I find that while I may wish to use a scripted opening and closing, I like to refer to a detailed outline during most of my talk. In addition, I prepare a list of key points and facts to reference during Question and Answer sessions. ~ To minimize the number of pages, I use 1.5-line spacing and half-inch margins on 8.5 x 11-inch paper. ~ To maximize readability, I utilize 14-point fonts, with Underscore, Bold and All caps as needed, with Seraphed Fonts for general text [unless you have a vision problem] and Non-Seraphed for titles. ~ To enhance the flow of your reading, end pages with the completion of paragraphs and quotes. Book: Ariel will be coming to the apartment tomorrow. Script: Ahr-iell will be com-n’ to the ap-ahrt-ment tom-mar-ah. ~ Insert single pages of your text in low-glare archival sleeves. This actually kills the rustling of paper. ~ Put sleeves within a solid colored three-ring binder. The front can feature one of your book jackets. ~ Position each sleeve uniformly on either the right or the left-hand side of the folder. This will minimize the movement of your head while turning pages. This will be less distracting to your audience and minimize variations in the sound quality at a podium microphone. ~ Place clearly labeled dividers between sections. This will facilitate spur-of-the-moment shifts you may wish to make during your presentation and Q&A follow-up. ~ Convert softcover editions of your books to spiral binding for quick reference and reading in less formal settings. You can insert sticky notes or other markers for passages you wish to access. As a writer, or other creative person, sensory perception can be an important element in preparing a stimulating picture via words or graphic images. We may not be aware of it, but the way an image or scent impacts us personally can greatly impact or work. One of the most effective devices for creating believable images is by consciously drawing on our memories. This is because referencing something we’ve encountered personally provides a depth of authenticity in whatever work we are undertaking. This does not mean that we have to reveal our personal circumstances in order to truthfully share a sensory experience. Of course, that may not be true if we are presenting a work that is a memoir or similar personal expression, for which we are obligated to reveal this aspect of our lives. The truth of our sensory experiences can be shared without revelation of the circumstances in which they occur. Isolating the experience from its original circumstances, can encourage us to revisit the specifics of what we saw, smelled, heard, touched, and/or tasted with greater accuracy. For example, while we may wish to describe the beauty of a star-lit night from our honeymoon, we do not need to provide details of the circumstances in which we viewed it. Even when we need to describe something we have not experienced, it’s good to seek out the concrete memories of those who have. In describing Shanghai in the 1920’s for Prospect for Murder, I drew on images shared by people whose fascination with the city transcended the actual era in which they traveled. And despite their degree of positive or negative reactions, I was able to utilize their perspectives to provide images of the bustling streets and even the scents they encountered in their sojourns. 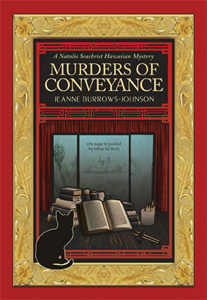 In Murders of Conveyance, the third book in the Natalie Seachrist Hawaiian mysteries, my heroine overhears a conversation in Chinese from outside of the building in which she stands. I’m sure we can all think of times when we’ve accidentally overheard a conversation, whether in a language we speak or not. When I moved to Honolulu at the beginning of the 1970s, there were many occasions in which I heard languages I couldn’t understand, nor even identify. Because I needed my heroine to feel connected to foreign dialogue, I inserted phonetic sounds that allowed Natalie to guess the speakers might be referencing someone she knew. Sometimes we are fortunate to be able to utilize vocabulary or pictures that effectively mimics the images we wish to share. I find the following words and phrases can bring clarity to a description, sometimes reaching beyond a single sense: wispy; screech; a snapping branch; wrinkled; razor’s edge; staccato; fragmented; shrunken; glassy; whispered; fiery. The perception of other words often relies on those who read or hear them. Reference to an Upscale dining experience may arouse the taste and ambiance of a five-star restaurant to one person, and a fast-food joint to another. While the phrase Opulent jewelry signifies a strand of synthetic pearls with rhinestones to one reader, someone else may envision weighty crown jewels. Vintage clothing could generate a disco scene from the 1970s for a millennial, whereas someone my age may picture a flapper dress from the roaring twenties—the 1920’s that is. Similar variances can arise with an author or artist’s use of color and shape, as well as a composer’s insertion of pauses, changing rhythms, and escalating tones. I’m fortunate that many of the images I wish to share in the O`ahu setting of the Natalie Seachrist mysteries practically write themselves: the sparkle and whooshing sound of incoming surf on a moonlit night; the stickiness of teriyaki sauce on a barbecued chicken thigh; the fresh fragrance of a flower lei, the stench of rotting plumeria blooms beneath an aging and neglected tree. But although I bring personal insight to such images, I must avoid cliché verbiage that will bore the veteran traveler. This brings us to a brief discussion of one’s audience…one’s target market. If you’re working within a recognized genre of literature, art, or music, there may be standards to which the majority of your audience will expect you to adhere. If you are striking out on your own to create a variant or wholly new artistic expression, you can move in any direction you wish…keeping in mind that you will need to attract some degree of a following in order to achieve any degree of success. In checking the date of my last blog, I realize how long it’s been since my last one. With all that’s taken place in the last couple of years, the conclusion of 2017 and the arrival of 2018 inspired me to examine the process that brought me to my recent birthday. What are your memorable birthday milestones?